Hello girls! If you do not know yet, BFF (previously known as Muffin Beauty) is a beauty community that allows beauty lovers like us to search or write our own reviews about beauty products on their website. From drugstore to high end, you name it. Just type in the product that you are curious about and a list of reviews from other members will come out. 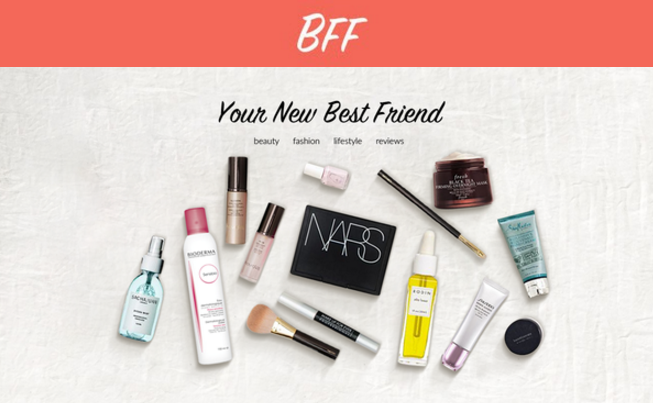 Ever since they upgraded to BFF, the website provides tons of articles covering female topics beside beauty reviews. It's like an online magazine! As an appreciation they sent out mystery gift box filled with beauty stuff last December to all of their members. Unfortunately I was a little behind to get the package on hand because I forgot to update my new address on the website. It was sent to Bintulu where I used to study but I manage to get my friend to help me post it to me here. So thanks to BFF and my best friend! haha, see what I did there? A local skincare product! I was so excited to see this inside the package because I was actually looking for something that can help with my acne scars and hyperpigmentation. The Neesya Illuminating Essence promises to boost skin luminosity, giving the appearance of translucent skin as it brightens the skin. It is packed with active ingredients that can help a lot in brightening so hopefully it is going to help with my current skin problem. I have actually used this for couple days and so far I am liking it. Will do a review soon. This water based makeup remover is very very popular among Youtubers. People just swear by this stuff. It just came in Malaysia last year if I am not mistaken. I did thinking about trying it but I never did buy it, probably because it is a little pricey for a makeup remover, plus there are other drugstore options out there like the Simple Micellar Water, which is basically a same thing if not a dupe. So I am really happy that I finally get to try this product now. Will let you guys know if I love it. Honestly I've never heard about this brand before but after doing some research I find out that these products do get quite high ratings from their users. The word 'powder sun' made me really curious, turns out it is actually a sun screen lol! I usually keep these kind of samples specially for travelling. It's nice to bring small packets lie this compared to a whole tube of face cleanser. I guess not all boxes were the same. Mine did not include the Silkygirl compact. Did you redeem it previously? Yep! I noticed that some people received the Purevivi cleansing lotion while I received the Bioderma.